The Lakewood Ranch Neighborhoods are growing! One new addition to Lakewood Ranch is the community called Indigo at Lakewood Ranch. The development is a Neal Community, which was voted Builder of the Year for 2015. Neal Builders is a family owned company, known throughout South Florida for their green development designation and for building homes at various price points. Indigo at Lakewood Ranch, is located north of SR 70 and just west of Lakewood Ranch Boulevard. Indigo at Lakewood Ranch is a single-family gated community with prices starting at $259,990. The homes are either 2 or 3 bedrooms, ranging in size from 1,407 to 1,764 square feet and 2-3 car attached garages. The entire neighborhood will consist of 453 homesites set around lush landscaping and mature oak trees. This community also features a modern clubhouse with kitchen facilities, a gym and yoga studio. In addition to the expansive community center, this neighborhood also has a full-time activities director. If you purchase in Indigo at Lakewood Ranch, Neal Builders will be paying off your CDD fees. This means that your monthly HOA dues will be kept between $200-$400 depending on which home you are building. In addition, if you have a relationship with a mortgage lender, you can now have that company provide the financing without giving up any builder incentives. You may be interested in the article: Building a New Home, do I need a Realtor? If you have been thinking about buying new construction, there are several things to consider. Lakewood Ranch has numerous neighborhoods that are being constructed. Some of those neighborhoods have a golf course and large fitness facilities, while others have clubhouses and pools. Depending on how much you want to spend per month as part of your homeowner’s association dues and whether or not you will use the facilities might be something to think about. Those model homes are beautiful and the salesperson for the builder is very nice and seems easy to work with, but just remember, they work for the builder. Having a second set of eyes and someone to assist with the upgrades and selections may not be a bad idea. Realtors bring 63% of the buyers to new homes, according to the National Association of Realtors. The community features four different style homes from the Cove Series, ranging in size from 1870 square feet to 2379 square feet. Neal Builders will also build four style homes from the Cruise Series, ranging in size from 1509 square feet to 1764 square feet. Below is an example of features that will exist for the Cove Series. Each series of homes have numerous upgrades available. Below is the standard options for the Cove Series. 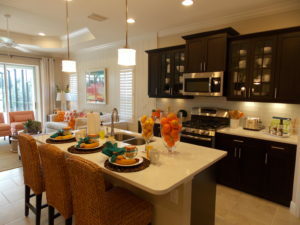 There are three model homes for Indigo at Lakewood Ranch that are available to view. 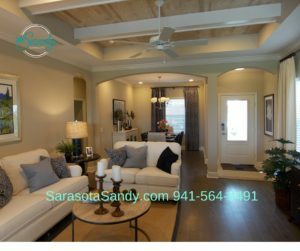 In addition, each model has a great representation of the floor plans available and various options for upgrades and wonderful decorating ideas as well. There are also new homes completed for immediate occupancy. There is also a professional in-house design service too. The town of Lakewood Ranch is an award winning master planned community and ranked as one of the top selling communities in the United States. Known for its diverse housing options and motto of “live, work and play”. The neighborhoods of Lakewood Ranch also enjoy the following amenities. Short drive to the world famous beaches and downtown Sarasota.